FIRST IN PLAYBOOK — W.H. HEALTH CARE PUSH NOT OVER … NANCY COOK: “White House acting chief-of-staff MICK MULVANEY is convening a meeting at Camp David this weekend with top White House staffers and key Cabinet members to talk through the administration’s direction on health care, according to a senior administration official. NEW: 2020 WATCH — ON THE GROUND: NATASHA KORECKI tells us that there is a behind-the-scenes staffing tug-of-war in IOWA between JOE BIDEN and PETE BUTTIGIEG that likely will happen in other states as well. As both near officially entering the race, they are late to the operative game. SENS. ELIZABETH WARREN and CORY BOOKER laid the earliest organizational groundwork and others who have joined the field have scooped up top flight hires. One Democratic consultant told her that while Buttigieg is capturing a new wave of excitement, Biden could have the upper hand because of long-term loyalties and relationships. — THE DAILY MAIL — “EXCLUSIVE: ‘He was always holding my hand, putting his arm around me, brushing the hair from my face.’ Jill Biden admits Joe — and his VERY handsy family — made her feel ‘strange and uncomfortable’ when they first began dating in new memoir”. TRUMP ON THE BORDER — L.A. TIMES’ NOAH BIERMAN, MOLLY O’TOOLE and RUBEN VIVES: “Trump visits Calexico a day after retreating from threats to close U.S.-Mexico border”: “President Trump argued Friday that the nation is suffering an immigration emergency, visiting the town of Calexico and inspecting a reconstructed border fence a day after he abruptly backed down from his threats to seal the lengthy border between Mexico and the United States. “With those threats behind him, Trump shifted gears and promised to construct 400 miles of border wall in the next two years, an unlikely benchmark for a president who has yet to build a single new mile of wall along the 2,000-mile border with Mexico. The section Trump visited Friday was a replacement of existing barrier planned during the Obama administration and paid for during Trump’s first year in office. MEANWHILE … “House sues Trump administration over border wall,” by Matthew Choi: “The House sued members of President Donald Trump’s administration on Friday over his emergency declaration to force funding for a border wall. The lawsuit, filed in federal court in Washington, D.C., asserts Trump’s emergency acts in direct disregard of Congress’ will and disputes the president’s ability to access certain funds for the wall simply by declaring an emergency. SPRINKLED IN WITH A LITTLE MIXED MESSAGING — GABBY ORR: “Trump’s border threats jam up Pence’s trade tour”: “President Donald Trump’s announcement Thursday that he would be willing to sideline a new trilateral trade pact with Canada and Mexico — a move that would allow him to impose the auto tariffs he has been threatening to unveil — couldn’t have come at a worse time for Mike Pence. “As Trump sat in the Oval Office, telling reporters that border security ‘is more important to me than the USMCA,’ the administration’s proposed replacement for NAFTA, his vice president was hours away from kicking off a multi-state tour to promote the renegotiated trade deal. Good Saturday morning. IT WASN’T ALL BORDER TALK yesterday for the president. ANITA KUMAR has the goods on Trump’s evening activity: fundraising. She emailed us that health care exec LEE SAMSON hosted the event at his Beverly Hills home where tickets were $15,000 for dinner, $50,000 for a photo op and $150,000 for participation in a roundtable discussion, according to someone familiar with the event. “Republicans on the committee say the only ‘judicial proceeding’ Congress can lead is an impeachment inquiry — a claim they say is backed up by legal precedent and history. Democrats would have to launch one against Trump if they want Mueller’s grand jury evidence, Republicans say. That interpretation would be problematic for Democratic leaders in Congress, who have little interest in launching a politically explosive impeachment process at the moment. “The official added that the administration is ‘not going to set the precedent’ of turning over tax returns for future occupants of the Oval Office, slamming the House Democrat request from Neal as ‘abuse and overreach by Congress’ and asked what’s stopping Senate Republicans from seeking House Speaker Nancy Pelosi’s returns. ‘They have zero right to it,’ the official said, who added Trump has also made it clear he’s not releasing his tax returns. TREASURY DEPARTURE LOUNGE – “Mnuchin losing two senior Treasury aides,” by Nancy Cook: “Eli Miller, chief of staff at Treasury and a former Trump campaign official, will leave the department next week, according to a staffwide email sent Friday afternoon. Close Treasury observers say Miller is expected to join the private sector. … Assistant Secretary of the Treasury for Public Affairs Tony Sayegh has also planned for months to leave by the end of May and is interviewing candidates for his replacement as the agency’s top communications official. In California, repurposed shipping containers are now home to veterans in need. ‘Potters Lane’ is just one way America’s Banks are supporting those who serve. 2020 WATCH: WAPO’S SEAN SULLIVAN and DAVE WEIGEL in New York: “With the most diverse presidential field ever, black voters ponder the best odds against Trump”: “More than a third of the candidates seeking the Democratic nomination for president are women. There are two black men, a Mexican American man, a Taiwanese American man and a gay man. “Yet, in the initial phase of the 2020 race, two straight white men have emerged as the fastest fundraisers, and another has jumped to a lead in recent polls, before even announcing his candidacy. The rise of Sen. Bernie Sanders (Vt.), ex-congressman Beto O’Rourke and former vice president Joe Biden in a field with historic diversity has caused dismay among some Democrats, particularly African Americans and women hoping for a mold-breaking nominee who reflects the changing face of the party and the country. TRUMP’S SATURDAY — The president will head to the Venetian Resort in Las Vegas at 10 a.m. PST. He will participate in a roundtable of supporters at 10:35 a.m. followed by remarks he will give at the Republican Jewish Coalition 2019 annual leadership meeting. Trump will then leave for the airport at 12:10 p.m. en route back to Washington, D.C.
SECURITY WATCH — ERIC GELLER: “Lack of security clearances hampers federal election panel”: “Only half the members of a federal commission advising states on election threats have security clearances, raising questions about whether it can effectively help local and state officials defend against adversaries such as Russian hackers. And no members of the four-person Election Assistance Commission had clearances during the past two election cycles, including the period when Kremlin-linked hackers are suspected of mounting a range of cyberattacks against state election offices, the Democratic Party and Hillary Clinton’s campaign in 2016. THE TRUMP ADMINISTRATION — “Education Department Has Stalled on Debt Relief for Defrauded Students,” by NYT’s Erica L. Green: “The Education Department failed to approve a single application for federal student loan relief in the second half of last year, according to new department data that signals that students who claim they were cheated by their colleges cannot count on help from Washington anytime soon. The department neither approved nor denied any relief claims filed by students under the so-called borrower defense program from June to December 2018, even after a federal judge ruled that the Trump administration’s foot-dragging was illegal. FOR YOUR RADAR — “U.S. to Designate Iranian Guard Corps a Foreign Terror Group,” by WSJ’s Michael R. Gordon, Warren P. Strobel and Nancy A. Youssef: “The Trump administration is preparing to designate Iran’s Islamic Revolutionary Guard Corps as a foreign terrorist organization, U.S. officials said, a step that would vastly escalate the American pressure campaign against Tehran but which has divided U.S. officials. The decision, which could be announced as early as Monday following months of deliberation, would mark the first time that an element of a foreign state has been officially designated a terrorist entity. America’s Banks are committed to supporting those who serve. Read how. MEDIAWATCH – “Exclusive: CBS News President Tells People She Regrets Accepting the Job,” by Yashar Ali in his newsletter: “Six sources who spoke to me said that Susan Zirinsky, the newly installed CBS News president, has been telling people that she regrets taking the job as the network’s news division chief. I asked my sources if she made these remarks jokingly, as there is no doubt that Zirinsky has her hands full remaking a news division that has been ‘taking on water,’ as ‘CBS This Morning’ co-anchor Gayle King recently put it. How do we make sure that our nation’s veterans have what they need to thrive? 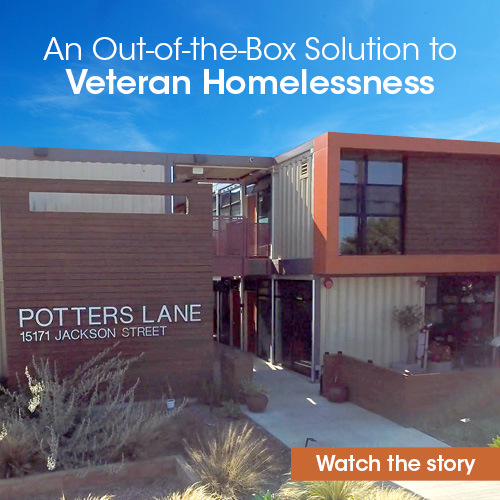 By thinking differently – as one bank did with its innovative Potters Lane housing solution for homeless veterans. It’s just one example of how America’s banks are supporting those who serve. Read more.